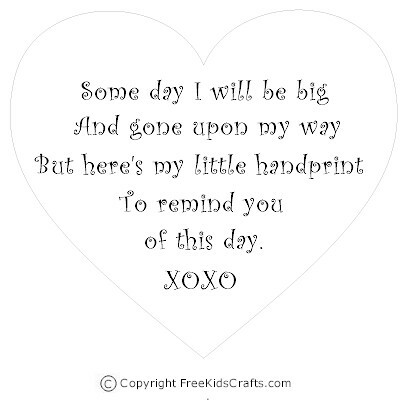 Have the kids make this Mother’s Day Handprint Poem as a very special gift for Mom on Mother’s Day. It will be something Mom will treasure for years to come and the kids will enjoy seeing as she shares her treasures with them over the years. Trivia: Did you know you have 27 bones in each hand. 8 of those are at the base right at the wrist and the other 19 make up the rest of your hand and your fingers! To make this Handprint Mother's Day Poem first spread paint in one paper plate. Press the child's hand into the paint and on to card stock or onto the other paper plate. If using card stock, trace around the hand and cut out. Print poem on pink card stock inside the heart outline. Cut out. Decorate the edge of the paper plate with flowers, ribbon and/or lace. Cut a 30" piece of ribbon make a loop in one end. Glue to the back of the plate with a loop at the top for a hanger. Glue the heart poem to the bottom of the ribbon under the handprint as shown in photo. Add a bow to decorate.